C25K, is a fantastic program that's been designed to get just about anyone from the couch to running 5 kilometers or 30 minutes in just 9 weeks. The Couch to 5K program is designed to condition your body for running – so instead of giving your body a sudden shock and going out for a 1 mile run, the c25k introduces you to running gradually, giving you time to adapt and get fitter. Its secret is that it's a gentle introduction to getting the body moving, starting off alternating between walking and running small distances, and slowly building up until after 8 weeks, you're ready to run 5 kilometers or 30 minutes non stop. Too many people have been turned off of running simply by trying to start off too fast. Their bodies rebel, and they wind up miserable, wondering why anyone would possibly want to do this to themselves. You should ease into your running program gradually. In fact, the beginners' program we outline here is less of a running regimen than a walking and jogging program. The idea is to transform you from couch potato to runner, getting you running three miles (or 5K) on a regular basis in just two months. 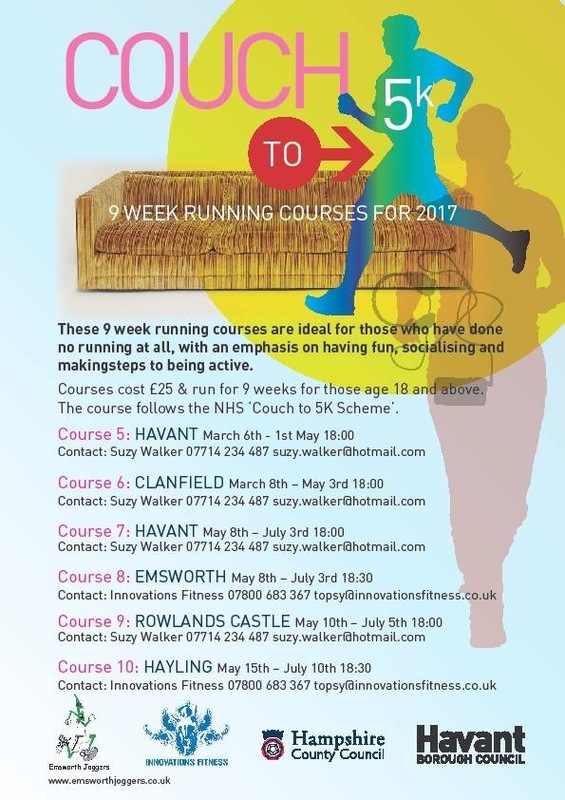 Details of courses that will be running in 2017 are below.